Recently, I’ve reviewed a number of well-designed and interesting books on birds. Today, I bring you an equally lavish look at a group bipeds that are perhaps a little more confusing: people. People who are into birds. 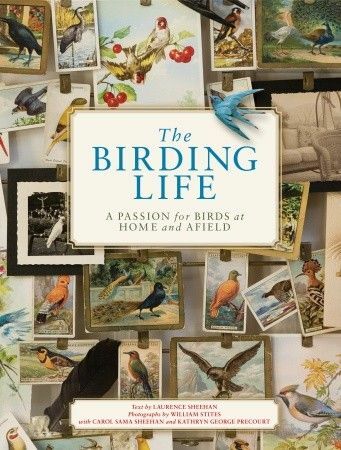 The Birding Life is another coffee-table-worthy affair, rich with color photographs and brief vignettes that encourage browsing. As you flip through the pages, you encounter names that every reader of this blog is likely to know, at least in passing: Julie Zickefoose and Bill Thompson III, Charley Harper, Kenn Kaufman. The text is divided, not taxonomically or chronologically, but with a weirdly visual bent – one section is devoted to what birders do, while roughly twice as many pages go to matters like decorating with a bird theme or collecting bird memorabilia and art. As I read, I realized that I had encountered books very much like this before. But not, mind you, on any shelf of popular science or ornithological memoir. No, this properly dwells in a specialized, glossy pantheon: literature that lets a would-be decorator or artist learn a style for their own use while also imparting enough narrative and fact to be of interest to more general readers. From shabby chic to high modernism, from plain old punk to steampunk, every style worthy of the name needs such a book. Ladies and gentlemen, we are witnessing the birth of Birder Chic. As with all fledgling aestheticizations, there are moments of awkwardness where it seems like the concept won’t quite take flight. Birders who delight in the genuinely lovely evocations of Central Park and Hog Island may look askance at “What to Wear” sidebars and digressions on bird-themed wallpaper. Contentious issues like parrot ownership, the role of hunters in conservation, and the romaniticization of bygone eras of egg and nest collecting are passed over with nary an acknowledgement that they are controversial. In fact, people who are more into birds than people are likely to be disappointed — unless, like me, you just enjoy meditating on photos of the Yale vertebrate collection. But on its own terms, this is a very engaging attempt to straddle the two cultures of arts and sciences, and in those terms I hope that it will soar. If one has to be inside, after all, bird-patterned wallpaper is better than nothing. Now I want bird wallpaper. Thanks? The “birth of birder chic” – I like it! I coordinate the 6-day Audubon Camps on Hog Island in Maine that are written about in this book – are you a camp alum? We’re still running the camps with many of those same folks you mention in your post teaching this summer. After being closed down for a year, the programs are now coordinated by Project Puffin of the National Audubon Society. I’ve been enjoying your blog for a while now – I’d love to meet if you come to Maine sometime! Next I expect a posting on how birders DO decorate their homes. I try hard not to engage in non-stop bird-on-the-wall, bird-in-the-fireplace decoration, but there’s a lot of neat stuff out there.